Who can see my annotations? : Who can see my annotations? Annotations are public by default and can be seen and shared by everyone. This includes API users (authenticated and unauthenticated, other Hypothesis users, anyone viewing the Hypothesis stream, and anyone who is using the Hypothesis client (even if they are not logged in). Highlights are private, visible only to you when you’re logged in (even if they are made in the Public layer). Open and Restricted Groups: Annotations made within Open and Restricted Groups are public by default and can be seen and shared by everyone. This includes API users (authenticated and unauthenticated, other Hypothesis users, anyone viewing the Hypothesis stream, and anyone who is using the Hypothesis client (even if they are not logged in). Private Groups: Annotations made within private groups are visible only to other group members. Please note that group members who are able to see your annotations can also share links to those annotations. However, if someone who is not a member of that group tries to follow the link, they will see an error message indicating that they do not have permission to view your annotation. LMS groups: Annotations made within an automatically-provisioned course group created via our LMS app are visible only to members of the course site in which that group resides (i.e., students and instructors). In contrast to non-LMS Private Groups, members of LMS groups cannot share links to annotations made within the group. 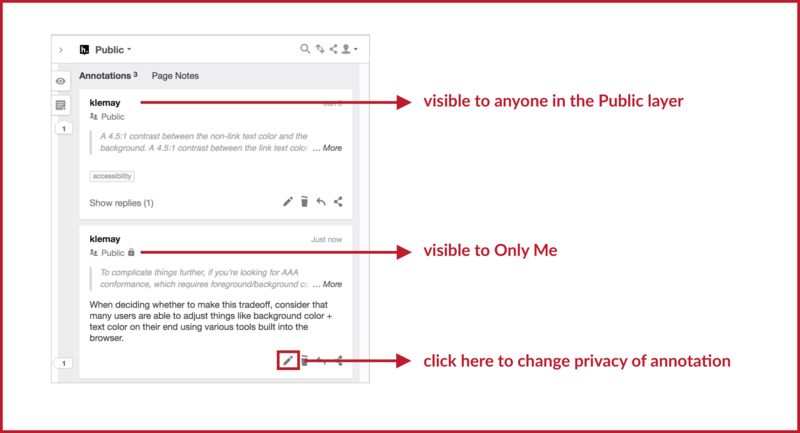 Regardless of group type, annotations in groups can be made fully private as well. A private annotation will have a lock icon underneath your username, next to the name of the layer where you made the annotation. You can change the privacy of your annotations at any time by clicking on the pencil icon at the bottom right of the annotation card. In this example, user klemay has made two annotations on a page; one that is visible to everyone in the Public layer, and one that is only visible to her.